Thank you for posting the update and am rather looking forward to this. I like his answer. Yes, but it night be something different tomorrow. Here, here! The event was held at the Hackney Empire, a fitting venue for the occasion. 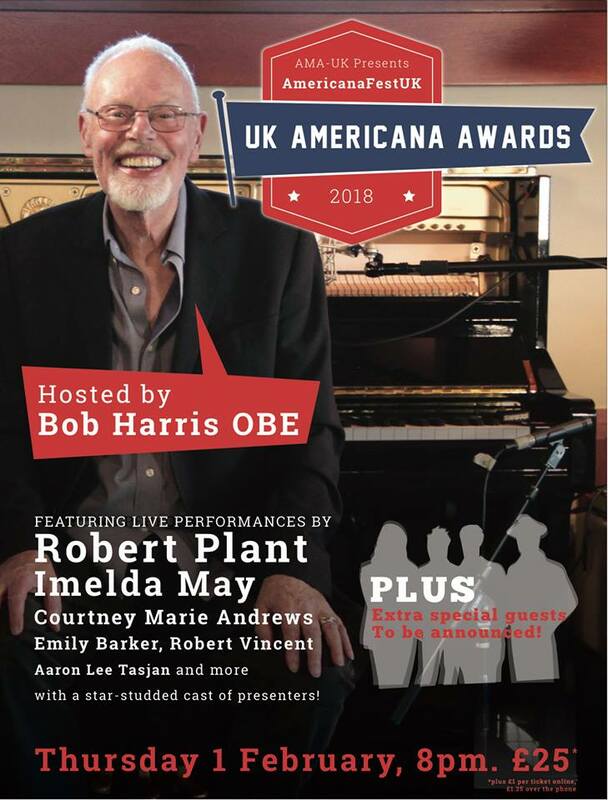 Compared by Mr Country himself, the wonderful Bob Harris, this was no dull trade awards ceremony but a slick, stimulating, lively affair interspersed with live performances from leading Americana artists. 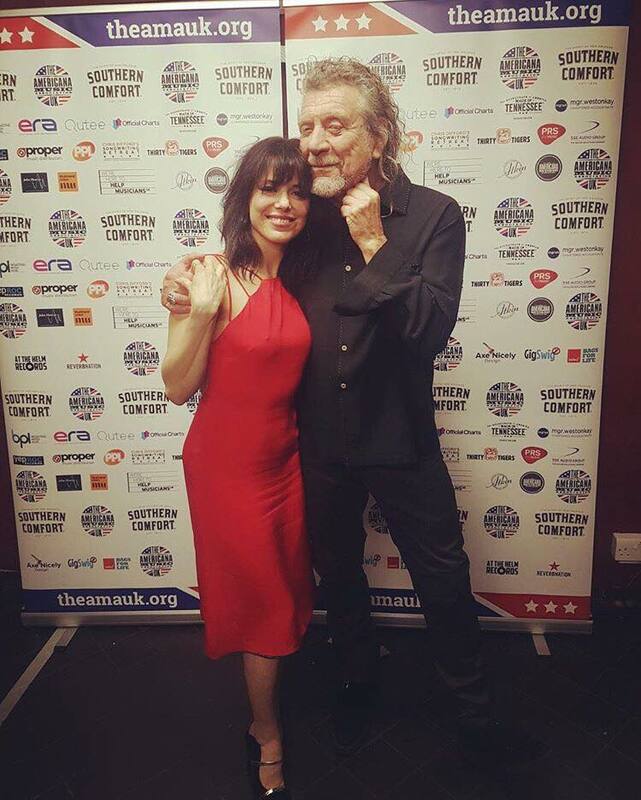 From Amelda May: Amazing night at the Americana Music Association UK Awards with an amazing man Robert Plant X. Thank you for posting that Sam. 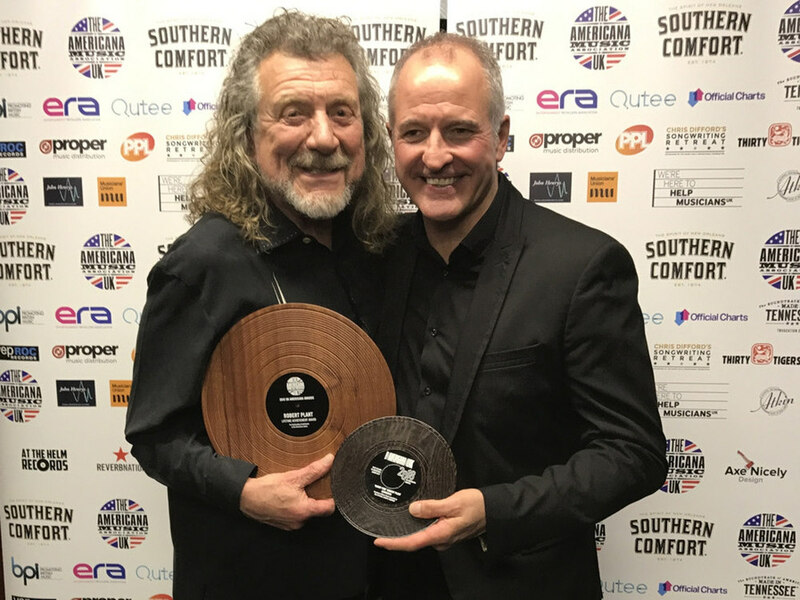 Rock legend Robert Plant was left speechless at a glittering music awards ceremony in London – when he was presented with an honour by surprise guest Steve Bull. 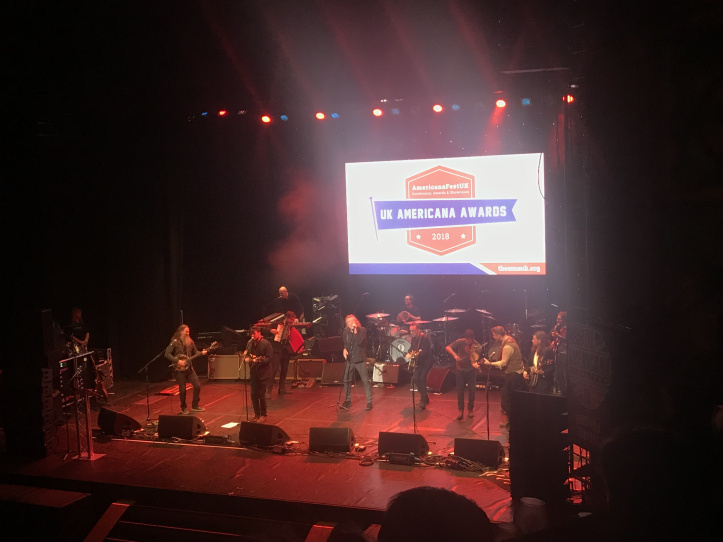 Organisers of the UK Americana Awards at the historic Hackney Empire knew Black Country-born former Led Zeppelin frontman Plant was a huge Wolves fan – and secretly arranged for the club’s record goalscorer to present the 69-year-old with his lifetime achievement award. Plant was left gobsmacked on Thursday night as legendary DJ Bob Harris called Bully to the stage in front of hundreds of fans at the iconic east London theatre. And Bull’s wife Kirsty told the Express & Star: “The organisers kept it a big secret from Robert – Steve’s name wasn’t even on the guest list as they wanted to keep it as a real surprise. “We were just named as ‘surprise’ and we were put in a private box to watch the show away from the stage so Robert couldn’t see us. “We couldn’t be too near the stage because everyone knew if Robert heard Steve’s accent, he’d guess immediately. 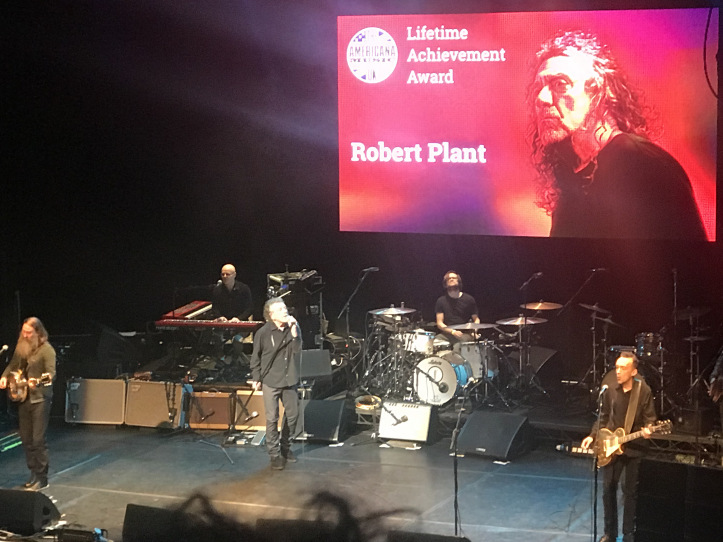 Plant was also presented with the award for Best Selling UK Americana Album of 2017 for his album Carry Fire. It has sold 54,580 copies, according to the Official Charts Company. I loved that video. Been trying to work out who Steve Bull was up against for the England team place. He deserved more caps. A recent interview with New York City classic rock radio station Q104.3. Was that common knowledge about Robert's Dad and Dunkirk. 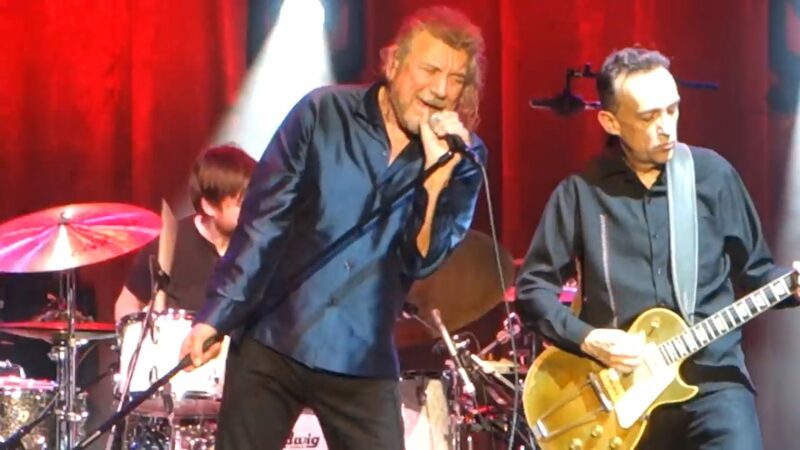 On Friday night Robert Plant & The Sensational Space Shifters kicked-off an eleven date North American run at the Duke Energy Center for the Performing Arts in Raleigh, North Carolina. The former Led Zeppelin frontman, who is touring in support of his most recent studio album Carry Fire, treated the sold-out crowd to a mix of material from throughout his career offering up Zeppelin classics alongside new material and traditional folk and blues tunes. The 69-year-old singer got the night underway with a string of material from his last two solo efforts delivering takes on “New World…” and “The May Queen” from Carry Fire, while also looking to 2014’s Lullaby and… The Ceaseless Roar for “Turn It Up” and “Rainbow.” Plant than offered up his first Led Zeppelin tune of the night turning to the iconic band’s 1970 psychedelic-folk-tinged third release for “That’s The Way,” staying faithful to album’s version of the song. “All The King’s Horses” from 2005’s Mighty ReArranger proceeded Plant’s biggest hit in the last forty years – “Please Read The Letter.” The tune, which was originally recorded for his 1998 album with his former band mate Jimmy Page – Walking into Clarksdale, later appeared on Raising Sand, Plant’s Grammy-winning collaboration with Alison Krauss. Robert Plant kicks off US tour. His show ranks as the coolest musicology on the road. RALEIGH - Robert Plant will turn 70 years old this August, an age where most rock stars seem content to coast on past glories. And while the iconic Led Zeppelin frontman could get by doing that, he has taken a far different course over the past decade – crafting one of the more improbable late-career resurgences in recent memory. Friday brought Plant to Raleigh’s Memorial Auditorium to open the U.S. leg of his “Carry Fire” tour, accompanied by the aptly named Sensational Space Shifters backup band. The tour’s second stop is Sunday in Charlotte. And while anybody who wanted to hear “Stairway to Heaven” came away disappointed, the show was indeed pretty sensational. Plant hit a post-Zeppelin high point with 2007’s Alison Krauss/T Bone Burnett collaboration “Raising Sand,” an Americana landmark. And since then, he has seemingly dedicated himself to demonstrating that the album’s “Old Weird Americana” aesthetic can work just as well when expanded to include the rest of the world. Friday night’s 100-minute set ranged from jam-heavy blues-rock along the lines of late-period Bob Dylan to intercontinental world-beat space-rock with a little of everything. I found myself scribbling phrases like “flamenco spaghetti-western beatbox” and “interstellar drumline” in my notebook, trying to describe various songs. The soldout crowd was, of course, adoring – almost too much so, because a few people kept screaming during the quiet parts. One husky male voice yelled repeatedly, “I LOVE YOU SO MUCH.” And when Plant got to the “I’ve got to ramble” line in “Babe, I’m Gonna Leave You,” a delirious “WHOO” went up from the crowd. You also got the sense that a lot of the crowd would have preferred more of the Zeppelin oldies. Those songs certainly received the most enthusiastic response (and the most camera time on everybody’s mobile phones). Expectations aside, however, it was a show that ranks as the coolest musicology on the road today. Selections included Mississippi bluesman Bukka White’s “Fixin’ to Die,” during which guitarist Justin Adams did a very cool solo where he hit the body of his instrument as much as the strings; fascinating interpretations of the folk songs “Gallows Pole” and “Little Maggie”; and Zeppelin’s “Misty Mountain Hop” arranged as a hoedown fiddle tune. The encore closer was “Whole Lotta Love,” another Zeppelin song that Plant has put through some changes on past tours. This version started out pretty straight up before veering into more idiosyncratic territory with a fiddle solo and sea-shanty chorus of “Santianna” that Plant threw in between verses (“Heave her up and away we’ll go, down to the Gulf of Mexico”). Then it was back to that signature dive-bombing guitar riff. Sometimes, after all, you just wanna rock. Thank you for that I really enjoyed it. Looks like he's lost a bit of beef since last year. Anybody know if Plant is in a relationship again? I love the chef's social media post about it. 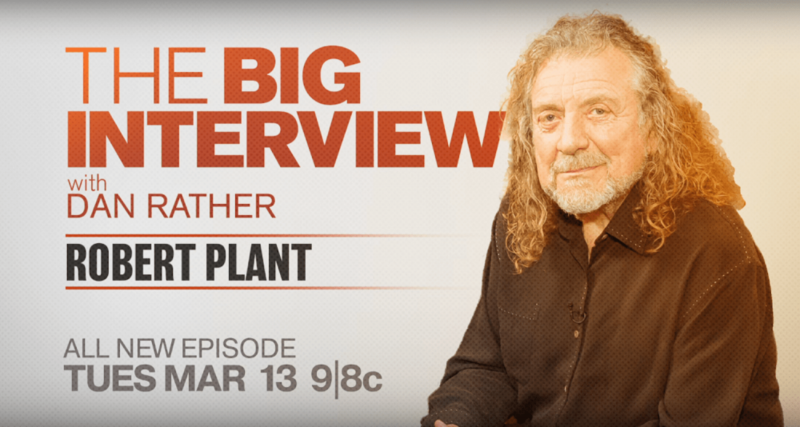 Robert Plant sounds pretty happy and comfortable where he is right now. This is from the Toronto Star a couple days ago. Nice article and interview with Robert. He knows what he wants and what makes him happy and probably one of the ways to sum up things for him now. Thanks for sharing Mr. Cali! As much as I love his music, showmanship in his concerts, plethora of musical influences and musicianship their are times his music can bore me to an extent! I can't figure this out and it's only been with the SS and SSS that I feel this way. I can't explain it, but their is some element of his music that is missing to grab my interest more and sustain it! 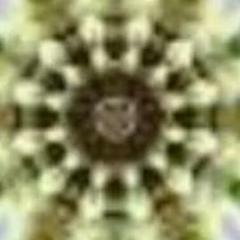 What is it and wish I knew as perhaps, you (Sean) may have the answer! And don't say JP! He doesn't want to talk about Zep during the 50th anniversary?? It’s the last question of the interview. The one that this reporter has been dreading to ask Robert Plant. 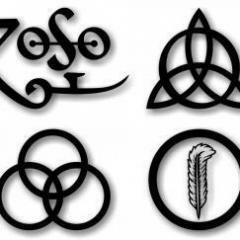 After a gulp of breath, the words tumble out: “On the 50th anniversary of Led Zeppelin, what is your fondest memory of the chemistry and camaraderie between the four of you?” There’s a second’s pause over the phone line and then the singer starts to laugh . . . and laugh . . . and laugh. Until then, it had been going so well. That desire not to be defined by the past, coupled with an innate artistic curiosity, fuels the singer’s intrepid post-Zeppelin career. Plant is more comfortable talking about “Carry Fire,” the critically acclaimed album he recently made with his longtime band, the Sensational Space Shifters. Plenty of artists talk about changing up every album, but few do so to the extent of Plant — each of his 11 solo records is distinctly different. “Carry Fire” exemplifies his pioneer spirit. Its songs find liminal connections between Appalachian bluegrass, Saharan blues, Celtic folk, Arabian trance, West Coast psychedelic rock, and British trip-hop. The band’s five musicians aren’t called shape shifters for nothing. Several songs also showcase guest viola player Seth Lakeman, one of Britain’s biggest folk music stars. The title track’s smoldering sensuality flares up with a Lakeman solo whose scorching effect lingers like a vapor trail. The album features another distinguished guest: Chrissie Hynde. The charismatic leader of the Pretenders (one of the few people who can rock a leather jacket as stylishly as Plant) duets on “Bluebirds Over the Mountain,” a ballad about a long-distance relationship that was popularized by the Beach Boys and Ritchie Valens. 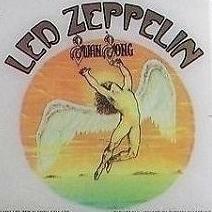 During “Bluebirds Over the Mountain,” Plant deploys one of the ejector-seat wails that were his stock-in-trade with Led Zeppelin. When the singer turns 70 this summer, his powerful throat won’t have any trouble blowing out all the candles on his birthday cake. But these days the vocalist’s most dynamic range lies in his ability to convey intimate emotions. On “A Way with Words,” Plant picks at the memory scars of a failed relationship and lets confessional asides hang in the air. The surprise of “Carry Fire” is how often this most progressive of artists looks back, for once, to take stock of his life now. Plants also revisits a different kind of past — world history — on several protest songs including “Carving up the World Again . . . a Wall and Not a Fence.” The lyrics contextualize the global backlash against today’s immigrants and refugees as a cyclical phenomenon that arises out of nationalism. In 2016, Plant joined Emmylou Harris, Steve Earle, Buddy Miller, and the Milk Carton Kids on the Lampedusa tour, a revue-style benefit for refugees worldwide. He’s being modest. Plant made a splash in the Americana music world with “Raising Sand,” the 2007 blockbuster he recorded with Alison Krauss, and his 2010 alternative-country album “Band of Joy.” During his career, Plant has pulled off more unpredictable moves than Bobby Fischer. What he hasn’t done is reunite Led Zeppelin for a tour, though he did organize a one-off show for charity in 2007. But his reluctance to embrace nostalgia shouldn’t be mistaken for a lack of pride in what he achieved with bassist John Paul Jones, guitarist Jimmy Page, and drummer John Bonham. After all, he includes radically rearranged Zeppelin songs in his shows. Once Plant stops laughing at how he can’t get through any interview without his past getting dredged up, his voice softens. Now, as then, Robert Plant still tosses back his curls, uses the microphone stand as a fulcrum, and changes the weather inside concert halls with vocal squalls. But he’s less interested in stardom than just being a part of the fraternal bond of the Sensational Space Shifters. “You can’t just turn up and become ‘that guy.’ It’s a lonely place to be for a singer to be just there, waiting to get in the way of musical passages. How do I spend my time during a two-hour set? Well, a lot of the time I am watching and listening to what my brothers are doing. As British rock giants Led Zeppelin celebrate their 50th anniversary this year, lead singer Robert Plant reflects on the good times, (not the) bad times, of what he likens to a former marriage. “It’s 50 years since I got married and sadly I only managed 13 of those,” joked Plant, 69, referring to Zep’s 1980 breakup after drummer John Bonham died. First up is the March 23 re-release of Zep’s 2003 triple-disc live album, How the West Was Won, followed by a new coffee table book by the remaining three members in October. More importantly, Plant, who brings his latest solo tour (with the Sensational Space Shifters) to Toronto’s Massey Hall on Saturday night for the only Canadian tour stop of his Carry Fire trek, says no one should hold their breath for a Zep reunion. We caught up with the singer down the line from a New York hotel. Zep guitarist Jimmy Page has promised “all manner of surprises,” for the 50th anniversary including another live album re-release. Can you spill? But hopefully the impact of the band will be recognized? It should capture the whole impact that we were oblivious to in the beginning where it was like a ground moving, ground shaking thing going on and interestingly we were so close into it that we didn’t even feel the tremors to begin with. And that’s a great thing before bands lock into a public persona or anything like that. So that kick off, 50 years ago, was something great, unexplainable, and so full of power and energy. It was brilliant. In the meantime, Carry Fire continues your love of Americana. Does that affect your performances which have both solo and Zep material? That means the way you play either has to be tempered according to that, or in my case, I couldn’t give a hoot. I just do what I do. That’s it. It’s a good time to be me because I haven’t dropped the ball at all. I just keep trying to open up the inside of, I suppose, a combined gift. Because the band and myself have sort of got this thing going on, which is really powerful. And what was it like working with Chrissie Hynde on a cover of Bluebirds Over the Mountain on the latest album? So many artists from the classic rock era have announced farewell tours recently. Will you know when the right time is for you? There’s no such thing as knowing when. Look there’s so many different ways of expressing one’s self and doing what I really love to do. The thing about retirement is that you can retire for a month or a week or a day or you can just go to the movies and call that retirement and come up inspired. Send some of these people to some beautiful places where there is lovely music and they’ll probably change their mind. Are you getting more political as songwriter with a new tune like Carving Up the World Again…a wall and not a fence from Carry Fire? I don’t think what I’ve sung about is at all unusual. It’s what everybody talks about on the street. There’s a lot of grumbling and mumbling going on but in high places there’s not a lot of opposition in the Senate or wherever it is. The voice of reason just seems to be stifled. Tomorrow night Massey Hall Toronto .....bring it on!! Robert Plant is hell-bent on making the most of his remaining years. “You’ve got to keep moving,” says the 69-year-old Led Zeppelin singer who when calling on a recent morning from New York City, while en route to a chess lesson, excitedly explains how in in the nearly 40 years since his most famous band’s dissolution he’s been on a “rampant search” and an ongoing “quest for creating great sound.” “I’m told you get a certain time in your life to do something and then after awhile maybe you just start repeating yourself,” Plant says, but the renowned singer has no intention of following that path. Am I crazy or do he shows seem short?